The solar eclipse on 20 March 2015 is very special for a number of reasons. It is the only total solar eclipse in 2015 and the first since November 2012. The March 2015 solar eclipse also falls on the day of the vernal equinox, a very rare event. Astrologically speaking, this solar eclipse is special because Saturn is still stationary, coming only six days after Saturn stationed retrograde. Of greater impact is the most significant and most challenging planetary influence in a generation. The last of seven Uranus Pluto squares occurred only four days ago so will have a major influence on this eclipse. Like any new moon, a solar eclipse represents the end of one cycle and the beginning of a new cycle. All possibilities are on the table and you can rightly put yourself in the forefront of new plans for the future. Old habits, behaviors and beliefs can be questioned as you search for new and inventive ways to make progress. This is the ideal time to make a fresh start and start writing down a to-do list on a blank sheet of paper. The impulsive and enthusiastic nature of a solar eclipse means that not all new projects will succeed, but through a solar eclipse in not only one point in time. The horoscope for a new moon or solar eclipse is like a snap shot in time, but like old style photography, it takes time to develop. This solar eclipse will remain active until the next solar eclipse in September 2015. As the eclipse cycle progresses, planetary aspects to the eclipse degree will mark more active times when events relating to the eclipse will likely unfold. There are no planetary conjunction to the eclipse degree of 29°27′ Pisces in this eclipse phase. However the 23rd of June 2015 is an important milestone, as Saturn is trine, and Mars is square the eclipse degree. The solar eclipse in the final degree of Pisces aligns with the fixed star Scheat in Pegasus constellation. It is a strong influence with an orb of only seven minutes. It is said to causes extreme misfortune, murder, suicide, and drowning. However it is possible for a positive spiritual and creative influence to be felt by those ready to receive such inflow. At the mundane level we can expect an increase in the number and strength of extreme weather events especially involving water, like floods and hurricanes. Air accidents and industrial strikes should also be on the rise. At the personal level, the solar eclipse new beginnings may be forced upon us by some personal hardship or misfortune among friends and family. With the Sun and Moon in particular, Scheat can bring worry, loss and gain of friends through criticism. There may be danger through water and engines and a liable to accidents or drowning. As you can see in the horoscope below, there is only one planetary aspect to the solar eclipse, a sesquisquare, or sesquiquadrate to Jupiter. This is a minor aspect of 135 degrees that indicates stress and tension like a square, but not so intense as the square aspect. The release of the built up tension occurs more through outer events rather than through inner psychological changes. The solar eclipse sesquisquare Jupiter indicates that via close relationships, reactions to negative or self-destructive traits will result in abrupt and challenging events. These negative character traits may involve extravagance, laziness, arrogance or jealousy. If, in the pursuit of riches and success, you have taken short cuts, or acted as if the money were already in the bank, then this eclipse could result in some event that forces you to learn self-control. This aspect also speaks of religious extremism, so there may be unexpected and yet more challenging outcomes in the war on terror. At the individual level, extreme beliefs may unfold in disturbing ways through elections. I’m thinking here of the influence of UKIP in the upcoming British elections. Saturn retrograde square Neptune brings anxiety, distrust, confusion, disappointment and pessimism. Any use of alcohol or other mind-altering drugs will increase the risk of confused thoughts and ideas. There is already a susceptibility with this aspect to believing weird ideas, and stubbornly disregarding the truth. We cannot forget the influence of Uranus square Pluto, for the final exact aspect between these titans comes only four days before this eclipse. Uranus square Pluto reinforces the theme of a major shake-up. This eclipse marks the end of this upheaval and crisis, a new start where we can begin to put the pieces of our lives back together. Change is not over yet with the lunar eclipse in two weeks directly aspecting Uranus and Pluto. However we can look forward to positive change more than upsetting change with a much friendlier and happier Jupiter. The northern vernal equinox occurs the moment the sun crosses the celestial equator heading northward, equalizing night and day. Vernal equinox literally means “Spring Equal Night and Day”. It marks the start of the Astrological year when the Sun enters the sign of Aries and thus marks the beginning of the tropical Zodiac. A significant day for astrologers as and it is also International Astrology Day. The vernal equinox is a highly significant event in many cultures, thus gives special cultural and spiritual significance to the solar eclipse. Likewise, the eclipse gives deeper meaning to the equinox this year. We have to go back to 1662 to find the last time there was a total solar eclipse on the vernal equinox. The spring equinox marks the first day of various calendars including the Persian calendar. Many countries celebrate this new years day with the ancient festival of Norwuz, including Iran, Afghanistan, Pakistan, and the Kurdish regions of Iraq and Turkey. Having its ancient roots in Zoroastrianism, it has been celebrated for over 3,000 years. It is also a holy day for Sufi Muslims and adherents of the Bahá’í Faith. The Great Sphinx of Giza was built to face directly toward the rising Sun on the vernal equinox. The Egyptian national holiday marking the beginning of spring is called Sham el-Nessim. It can be traced back as far as 2700 BC and was always celebrated on the vernal equinox. Due to the interference of the catholic church, it is now celebrated on Easter Monday. Despite attempts by the catholic church to erase indigenous cultures, the spring equinox continues to be very significant to people around the world. In fact the catholic festival of Easter can be traced by to the Celtic celebration of the vernal equinox. 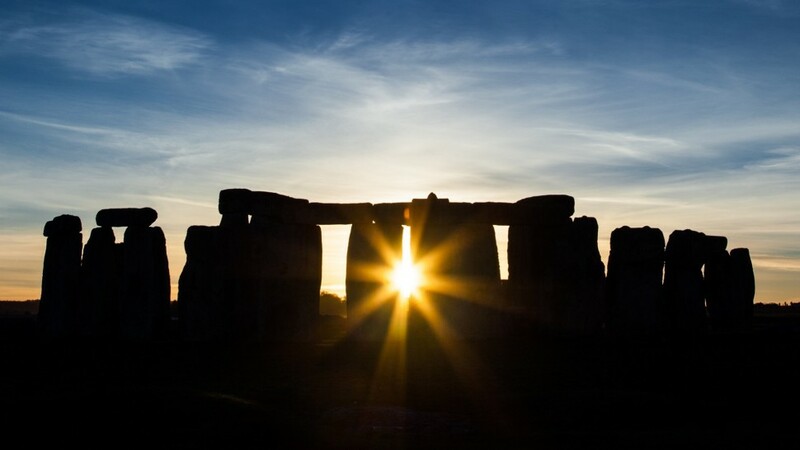 The Druids called the vernal equinox Alban Eilir, ‘The Light of the Earth’. Alban Eilir was associated with the German goddess Ostara. The Saxons brought her to Britain as Eostre, where her name became Eastre. Her name is the root of the words east, Easter and oestrogen. Eostre is the goddess of the dawn, the bringer of light and new beginnings, spring and fertility. Symbols of Eostre and Alban Eilir are the hare representing fertility, and eggs representing new life. Rabbits are prolific breeders, and like the spring equinox they symbolize playful sexuality. Hares were also sacred to Aphrodite and Eros because of their high libido. Like a solar eclipse, the equinox symbolizes a point of balance between day and night. This solar eclipse is a perfect time to open to the quality of balance in our own lives. During this of transition, we can let go of the old and plant symbolic new seeds. We may seek freedom from relationships, jobs, responsibility, anything that makes us feel confined. The more dysfunctional our lives have been in the last six months, the stronger the need to be free. Soar eclipse March 2015 on the Spring Equinox, plus being visible over the ancient lands of the Celts is a significant event, reinforcing the declining influence of the catholic church and the resurgence of pagan tradition. My natal Mercury is in Virgo 29 and is my final depositor in my natal 7th house. I see this as the maker for end of the Piscean age, we also have the next Jupiter Saturn conjunction in Aquarius in 5 yrs. End of Piscean, yes. Beginning of Aquarian, February14, 2016. We made it, but Armageddon is predicted for June 12-18, 2018. I just had a look using Astrodienst and Lubitz also had Jupiter transiting his natal Lilith, which is square to his Pluto and like you pointed out his natal Mars. I would also like to point out that the mainstream media is omitting the fact that Lubitz is of Jewish ancestry, hence his surname. According to Astrodienst, “Lilith in Jewish mythology already puts her into darker realms – an evil Demon of the night, a fitting mate for Satan, lying in wait for men, and killing children”. Maybe he had a secretly held grudge about the global anti-semitism sentiment at the moment? “Murder”, “Suicide” and “air crashes” Very prophetic Jamie, in light of the French Alps air crash last week. A brilliant posting. Thank you. What if my birthday is March 20th?